November is the month of gratitude, not to mention a very busy time of year for everyone. While it’s important to teach and practice kindness all year round, November is the perfect time for students to learn and practice being thankful. It is also a great chance to teach students about the origins of Thanksgiving. One of the best ways to help students learn about the holiday is to have a classroom Thanksgiving Feast. There are so many activities that can be used to plan and prepare for the classroom feast, that is can honestly be overwhelming. So much goes into the feast that is is more than just turkey-themed centers and yummy food. Here are some simple, yet effective and engaging Classroom Thanksgiving Feast ideas to help you get started. When planning a Classroom Thanksgiving Feast, it is important to think about space available for the party. If you have a smaller class size, your classroom may be sufficient for hosting the feast… but if you have a larger class size, or will be inviting parents, you’ll want to think outside of the box. Moving desks and tables around in your classroom may give you the space needed. Just know that your classroom may not be the only option you have. Look for other areas in the school where you can host the feast. The gym is a great location because there is plenty of room, and the hard floors make it easy to clean up after the meal. Some schools might allow you to use the cafeteria before or after the regular lunch times. Talk to admin to see what options are available. If you live in a warmer area (like Texas 😉 ), then you could have the feast outside. Be sure to have a backup plan in case of inclement weather. Before deciding what you want your students to serve, you’ll want to first decide if you want to have your students help cook the food too. Cooking in the classroom is powerful, and by allowing students to cook the feast, you are giving them an immense ownership over their learning and the party planning. Feast day will be a blur and be over before you know it. Several of the menu items can be purchased pre-made, making it easier on the day of the feast. You can also ask parents to donate feast items (more on that below). Talk to the managers at your local grocery store and to let them know that it is a school activity. You could potentially get some donations or discounts to offset the costs. Pumpkin Pie Dip is a great alternative to cooking a pumpkin pie, and it’s super easy for students to make. You can find that recipe here. Decorations don’t need to be elaborate or time consuming. Involve your students in decoration creation! Not only is it fun for them, but it gives them a huge sense of ownership of the feast. They will be so proud to show off their hard work to the feast attendees. You can also precut turkey shapes out of paper, and then do a disguise the turkey activity. Turkey Trouble is an engaging read aloud that students and parents will both enjoy that goes along with the activity! Create pinecone turkeys by gathering pinecones and attaching bright colored paper feathers and a face made of felt or foam pieces. Plan a Community-Based Field Trip to a local pumpkin patch (or the local grocery store) a week or two before your Classroom Thanksgiving Feast. Allow each student to choose a pumpkin or squash that can be placed on the table as decor. Create simple invitations that can be sent home with the students to invite the parents and family members to attend the event. Use this free, editable template. It is a big undertaking to plan a Thanksgiving dinner at school. But it is absolutely worth the effort. 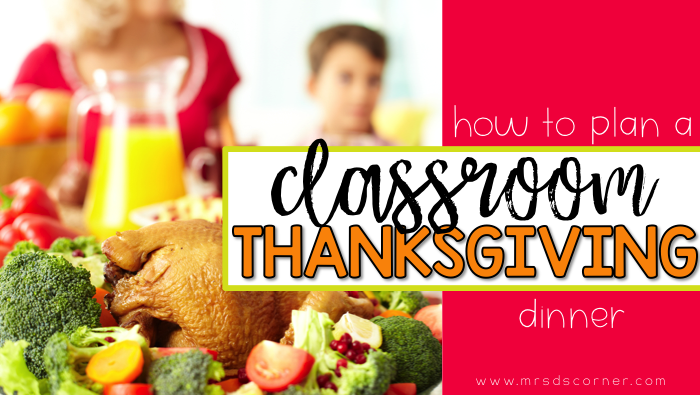 Your greatest asset in planning a classroom Thanksgiving feast are the parents of your students. It’s important to know that you don’t have to do everything on your own, and more often than not, parents want to help! They are just unsure of how to ask or what you need. Reach out to parents to see if you can find a few volunteers to coordinate the efforts. 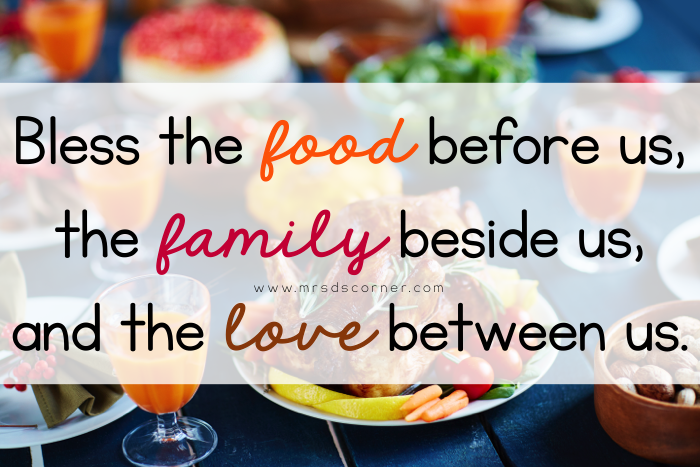 You can oversee the planning and hand out assignments to people who are available to help, or you can choose someone to be in charge (like a Room Mom) to help plan the feast. Not only will this give you the chance to create and host a fun event, but you also get to know the parents of your students by working with them toward a common goal. In addition to the delicious student cooked meal, you can incorporate games and center rotations to make the feast even more fun. 5 Simple Thanksgiving Centers: Thanksgiving center rotations are great to fill time the meal is not enough. You can easily start the feast with these quick, simple centers that parents can help students with. Snag the FREE centers in the Resource Library. 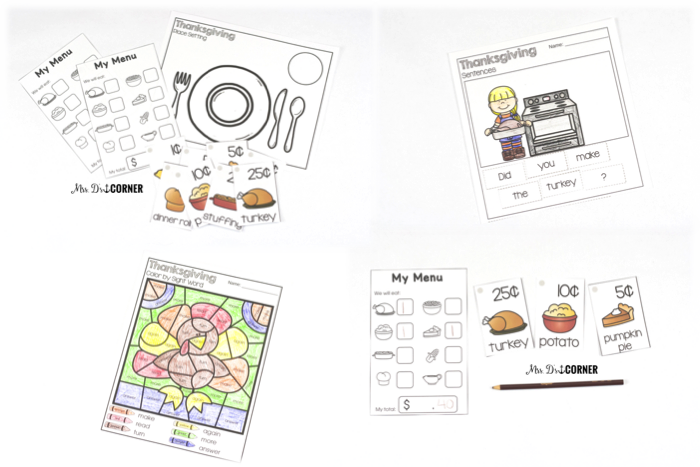 Includes making sentences, addition by color, color by sight word, dot to dot to 35, place setting practice, and building a Thanksgiving menu with prices. Pin the Feathers on the Turkey: This activity is similar to “Pin the Tail on the Donkey.” Cut out a large turkey to hang on the wall. Then, let students take turns pinning the tail feathers while blindfolded. 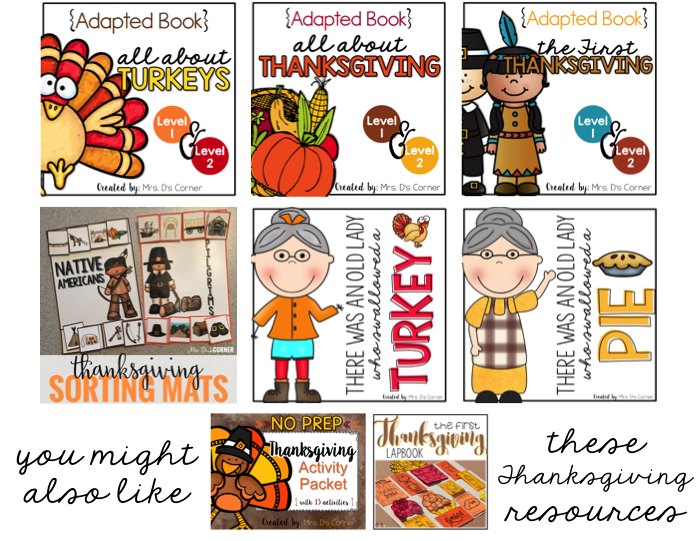 Scavenger Hunt: Hide Thanksgiving items around the classroom (use this Thanksgiving-themed Write the Room activity – free in the Resource Library) or the school (this would be a great recess activity!). Then everyone can go on the scavenger hunt together to find those items. “I am thankful for…”: When everyone sits down for the meal, invite students and parents to share what they are thankful for. This is a great time for students to share why they are thankful for their parents, and parents can reciprocate and share why they are thankful (and proud of) their child! A Classroom Thanksgiving Feast can create lasting memories for you to share with your students and their families. Don’t forget to snap a few photos during the activity, so that you can hang them on the bulletin board for everyone to see. This dinner will strengthen friendships and help students work together as a team, and the photos can be used to remind them of the successful party that they planned together. What tips do you have for planning a Classroom Thanksgiving Feast? Or what other questions do you have? In the Resource Library labeled “Centers”. Can you update the printable invite to say 2018? What if we forgot our password?